Let’s just say we like to walk into the “young married” Sunday school at church and pretend:). Also–we used to go to a big church that did away with Sunday school. What the what? Let me just say Sunday school people is brilliant. 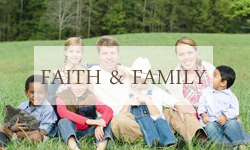 Your kids learn about Jesus while you learn about Jesus with other couples your age. Why in the world we’d want to do away with Sunday school is beyond me. We’ve loved the “small groups” we’ve been apart of–but Sunday school is a pretty sweet set up with childcare not only in place…but also sweet community for our youngsters to meet with other kids their age and grow in Christ together–something that is hard to pull off with a small group too. Church has been an important part of our lives for a long, long time. We’ve been down some sweet roads–rocky roads–and even hard, confusing ones with the churches the Lord has led us to. Each served a purpose–and we finally feel we have landed home. If you have given up on the church or the church search for the one you feel at home in–I get it. I really, really do. But can I just encourage you–don’t give up. Sweet community really is found in the church. Also–the church is a mess—simply because it’s full of messy people. Give lots of grace and don’t give up. 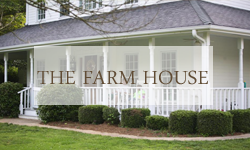 It dawned on me a few months ago as I rocked Janie Claire outside in the halls at our sweet church in Alpharetta we are calling home–what we’ve really been missing out on. For 10 years we were at a non-denominational church that had a black pastor, a hispanic ministry and it was in the middle of Roswell–so it was quite diverse. Yet–there was something missing. We had grown a bit comfortable, and the Lord led us to branch out a bit for a smaller church. For 1 year after our short search, we were at a newer church meeting in a school cafeteria. We had a bit of a roller coaster ride saying yes to some hard needs in the church–and soon realized this wasn’t our church home either. This momma wanted to run right back to comfortable–to the church we’d been a part of for 10 years. But. I knew there was something missing. We began visiting other churches hoping to find a place to grow our children up in, and after visiting so many bigger churches in our area (in the city–one thing we aren’t missing is big mega churches)—we found ourselves landing at a traditional Baptist church. Now I grew up Baptist and said I’d never land at one as legalism was something I struggled with when I was newer in my faith. But…this just felt like home last Christmas when we finally landed here. Finally. Months later, I rocked Janie Claire outside the sanctuary–and as the traditional chapel service ended before the contemporary worship service–I made lots of friends as I bounced our new little one. These friends who attended the traditional chapel service–they are all over 70 years old. I realized it had been over a decade that we’d attended a church with significant elderly attendance. In fact MOST of the churches we visited had very few elderly people. It wasn’t until these long Sunday conversations that I’d realized how much I’d missed being in community with elderly specifically at church. Then it dawned on me that so many of our churches have worked so hard at reaching the younger generations and providing cutting edge worship and such–that many churches are missing this age demographic altogether. I didn’t feel the void of that until we had it again–and oh my…am I catching up on the sweetness of these group of older, wiser men and women who have gone before us and offer so much. There have been so many sweet conversations at church each Sunday in those halls…that now I must also confess Richard and I are attending and loving the traditional service in the chapel full of it’s hymns and older generation that we’ve so long missed. …the hymns we sing in chapel have stood the test of time. There is such healing, truth and encouragement in so many traditional hymns. I grew up singing these and hearing them now stirs a bit of a revival in my heart. Gosh–they are so beautiful and so good. (I am currently reading a hymn and studying a hymn each week and it’s sweet origin with my 2nd grader who is still homeschooling. This is our favorite book for reading and learning hymn history It’s SO GOOD!). I have to recommend Fernando Ortego for bringing hymns into your home. He’s on repeat in mine. 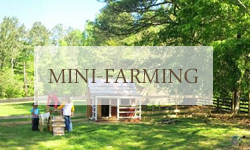 Get a taste of the simplicity and peaceful worship here. I really think it’s so important for our children to also learn worship songs that speak to them NOW–songs that will still be played 50 years from now too. …most of what we are tempting to worry about–really isn’t worth worrying about. Tell someone about 50 years ahead of you what’s on your heart–and you’ll get the most realistic, eye-opening, laid-back and real advice you can ever ask for. I’m reminded over and over again what REALLY matters. Most of the time–what is burdening my heart I soon realize I really can give that to Jesus and trust Him–and I have all I need. …Grace. We all need grace. And we need to give a lot of grace. Simple as that. I can stay at home for rest time and miss Bible study or worship time–and my sweet old friends give me so much grace. They even grab me the next week and ask if everything is okay–and remind me that I was missed. It’s good to be missed. We live in a culture where so many churches are so mega that we can often not feel missed or miss others–or we are too busy to let them know how much we missed our friends who were missing and to do the simply thing and just check in. I know this sounds so simple–but these simple acts of love and friendship are becoming a missed and void art in friendship and brotherly/sisterly love in Christ. How thankful I am the Lord led us to the church He led us to. I never ever imagined that I’d be slipping into the traditional service with my elderly friends. I guess I’m making up for lost time after being in churches for so long that had so few of this generation to lead us. But how thankful I am how He leads and what He’s teaching me after so many years of missing this most precious, wise generation of friends. Please forgive any typos and such–this mom has hardly any time to write much less proof read what she does:) Blessings to you! We started a new chapter this season after homeschooling 5 years. Three out of our 6 kids decided to go to a sweet little school around the corner. They are LOVING it–but momma is missing having all her babies home. Thankfully–I still have 3 to keep me busy at home! Pretty soon it’ll just be 2 kids in the morning as one will be going to a kindergarden preschool each morning. 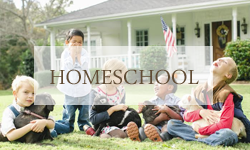 I’m looking forward to having just ONE to homeschool (my 2nd grader!) and the sweet baby to cuddle with between lessons. The baby is doing wonderful! I’m really loving having a baby at my age and having other littles who are bigger reminding me each season is such a short, sweet season. So thankful for this gift and the joy to be a mommy again. The most important thing for both Richard and I in staying connected to one another, leading and guiding our children and staying connected to our children has been staying in God’s Word. Y’all. It isn’t easy when you have lots of kids–or a baby who doesn’t sleep–or laundry, cooking and cleaning to do…but never, ever let that go. Find accountability like a weekly Bible study or group to meet with. There will be season when that feels impossible–and the more impossible it feels–I reach out more. 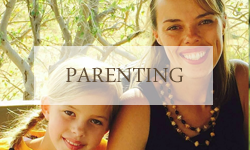 This season right now with a newborn, preschooler, homeschooler, 3 at home = 3 coming home with homework and 5 different sports activities…gracious–I knew this time I needed serious accountability. So I signed up for a women’s study at our church that meets once a morning every week for 15 week segments. I might be running in there with a baby, a preschooler and a homeschooler with a backpack full of things he can work on–but listening to someone teach and getting in God’s Word with other women has been so wonderful. We are studying the book of James–and oh my has it been right where I needed to be with little decisions always there to be made for our children. Knowing which way to turn is so much clearer and easier to navigate during times where you are walking with Jesus. If you find yourself in a season where it feels impossible–just take a breath and find a way. Pray for your children, your marriage…the little things and the big things. Watch Him provide and even bring PEACE in the midst of crazy schedules. A deep walk with Jesus is the most important thing you can give your family…it truly, truly is. So don’t give up!!! Blessings to you all as school is back in full swing however it is your family does it! Our hearts are grieving at the loses of both black lives and policeman this week–and for many of us we are at a loss of words. As a white mom raising a black son–my first response is fear. Then–I look UP. Jesus—and His perfect love…and perfect love drives out fear. Until having a black son, I didn’t realize the reality of how even if things change–I will have to raise my black son differently than my white sons. One I’ll have to coach how to keep his hands raised and not reach for his wallet when he is pulled over for speeding or a tail-light—and the other…honestly I’ll just have to tell him to just use his manners. In just 5 years of being a mom of a black son, I’ve already experienced racism that I never knew still existed. 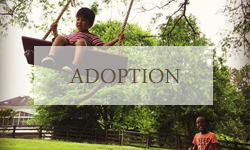 I know without a shadow of a doubt that the Lord called me to be a mom to my boy–my black son as well as my other children both brought to us through adoption and biologically. But I can’t do it alone. I need a village–and not just a white village. Long before adoption ever entered our lives–God surrounded me with the best friends as neighbors–neighbors who just happened to be black. They became the godparents to my white children first–and then later–they would help me raise my black son. Seven years ago, Created for Care was launched to support foster care and adoptive moms in raising their children–and each year we have sessions on raising our children of different races. We record the sessions so moms who can’t attend can purchase the sessions and also attendees can purchase them to take home to their village of mommas to support and encourage them. Our non-profit also uses these recording sales to raise funds to support our ministry so we can continue to do what we do. We would like to gift this video segment to moms everywhere–both raising black children–and also raising white children. If you aren’t raising black children, I encourage you to watch this session so you can be the village and support those who are. So you can learn a little bit of what these parents and children will face that you may have never thought about. May we stand together–love our children together–and not give up…for us–for them. We need each other now more than ever. Our next retreats are February 3-5, 2017 and March 3-5, 2017. Registration begins August 15, 2016 at 12:01 am EST. Be sure to register early as our retreats fill up quickly. I heard someone say there’s never been a more uncertain time in our country or a time when we were more divided. I say that’s untrue. Remembering the past always gives me hope for the future. Having taught U.S. history this past year, our country is paved with uncertain times yet the spirit of freedom and justice some how always lined the streets bringing hope in the end. I’m really not worried about what is to come because there really have been awful presidents before who shockingly left even my children’s jaws dropped as they learned of their policies and actions. Yet without fail America’s people always came together to fight and stand for what was good and right. Consider the man many will talk about today–who gets credit for being the principle author of the Declaration of Independence for example. (Oh Jefferson–you may have been an American Founding Father—but anyone who spends an afternoon reading Jefferson’s Sons and digging deep into other things this president stood for–and I must say you will be left equally if not far more disappointed with dear Thomas than the histories of the candidates you have to choose from. I really believe that the Lord is over even the bad presidents and their decisions. I really do; And seeing God’s faithfulness in the past gives me so much hope for our country’s future. This practice of digging deep into the reality of the past–remembering not only the good but also the stories and times that seemed hopeless–remembering how each and every circumstance was overcome–gives me so much hope each and every morning in my own personal walk as well. I’ve left a baby in the NICU and felt the separation a mom feels leaving her baby who was meant to come home with her. And I watched that boy receive an award as the top offensive player for his soccer team. I’ve signed papers to bring a boy home that they said might not make it home…later making the best friends in physical therapy sessions hoping he would walk–to see him fly in the air as a goalie and beat his big brothers in relay races leaving us all wiping away tears remembering how far he has come. Motherhood hasn’t always come easy to me either. I’ve also wiped away tears in the passenger’s seat on the way home from the doctor’s office when the heartbeat stopped on an ultrasound. Years later…here I sit just trying to type reflections on today are only possible after asking my husband if he could just hold the baby for a few minutes while I jot some thoughts down on my blog about God’s faithfulness…remembering the God of my past–which inevitably leaves my heart in a personal revival celebrating who He is and trusting Him bigger for my future. This practice has radically changed how I live fueling me every day to live bolding and bravely as I trust Him for whatever the day brings. If you want to be filled with hope for the Lord in your personal life and for what is ahead–remember the God of the past and all the hard you may have faced–but don’t just sit in the hard. See and remember how the Lord walked you through it, what He taught you in it and how He delivered you from it. What a beautiful way to spend today as we celebrate our country’s birthday remembering those who fought for our freedom making this day a day we celebrate with the booming sounds not of guns…but of fireworks. Yes–there are stories of guns that break our hearts but they don’t break us a people standing together. We still have so far to go–but if you take a quick glance of history–we have always had far to go. And it’s my prayer that we stand together for what is good, right and just–as we have in the past and trust the God of our future and stand in His faithfulness without worry or fear of what is to come. The Israelites remembered the past and His faithfulness through stones. On the very field where the Israelites had once experienced defeat–they asked God to help them and they were led to a miraculous victory. Their leader Samuel built a memorial of stones and named it Ebenezer “stone of help” so they would always remember what happened there and how God helped them. Every time they pasted these stones, they would remember what happened there and how the Lord fought for them. Our flag serves as our country’s Ebenezer. It reminds us of battles fought, states won, lives lost. Every stripe–every star…placed not just by a few stitches but with brothers, sons, husbands and fathers. And something really powerful happens in our own hearts when we remember the God of our own past as we start each day knowing the God of our future is the same yesterday, today and tomorrow. For me–my Ebenezer is…as trivial and crazy as it might sound–well…it’s TimeHop. I start many mornings looking at pictures that pop up. I don’t just look at them but I try to remember what those “stars and stripes” really mean and where I was in those days that pop up in those pictures. Today it was the video of a Ukrainian girl singing–who we hosted through a orphanage hosting program. She was singing a Christian song on the video with the words to Jesus “YOU are where I belong”. Wow. At the time–four years ago today…thank you TimeHop–she was completely displaced in our country where she didn’t know the language yet something within her was singing. Trusting. Believing that with just Jesus she had enough–wherever He leads her was where she found belonging. Fast forward to today. That precious girl is in a family, adopted by friends we love, deeply loved herself, a high school graduate, about to start college, working a job this summer, in love with Jesus still believing and trusting with a history that some of us will never experience…my gracious–reflecting on that leaves me in a revival of my own! Today I’ll start Independence Day remembering what it stood for and being thankful for what the stars and stripes really stand for. And in my own life–I embrace this single practice and continue to start my day with my Ebenezer…remembering God’s faithfulness. This practice has personally transformed my own walk, how I live and how I will choose to say “yes” to however He leads because I’ve seen His faithfulness in the past and want to trust Him more with my future. This practice is truly where my freedom is found. And today I start my day dancing remembering all He has done! Let freedom ring on my heart chants ready to start another day! Freedom is found not by mere words saying you are free…or having it written or signed on paper. History teaches us that some times even the ones who write or say the words don’t really believe or live them. But it’s living in freedom that changes every thing. Freedom is found when the heart no longer lives in fear of future. It is with bravery and releasing fear soldiers won our freedom–and it’s with bravery and releasing fear we find freedom in Christ. Let freedom ring wherever you are today–and may you really live as you look at your Ebenezers–whatever they might be–remember the God of your past and His faithfulness–and with THAT new found freedom–trust Him big for whatever is ahead. This weekend means…we made it to 39 weeks waiting for baby #6! It’s been almost 8 years since we have had a newborn in our home–so I think my almost 40 year old brain has forgotten most everything about these last days of pregnancy. Our “paper pregnancies” to bring home our last 2 loves through adoption were laborious in different ways. I told Richard that they were easier and harder in different ways–I knew travel dates when we were this close to seeing our last 2 loves–but oh my gracious knowing we had a toddler and a preschooler just waiting across the world was crazy hard on this momma’s heart! With this pregnancy I have been 3 cm dilated now for 3 weeks and a week of prodromal labor like nothing I’ve experienced before with contractions and no sleep the last 4 nights. 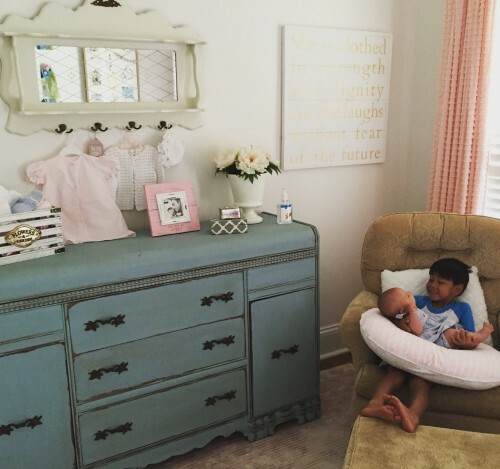 I keep reassuring myself that it’s baby girl getting ready–but momma is tired! 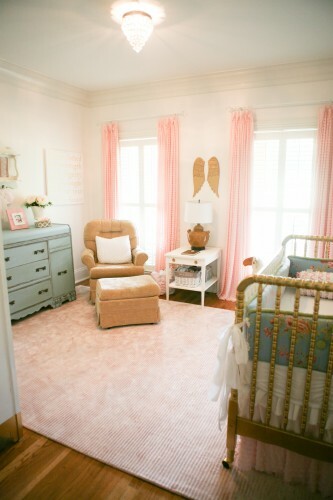 Here is baby girl’s nursery…now we just wait on a baby! I found the Allen & Roth light fixture at Lowe’s. The room is smaller so using a chandelier would have made the room feel smaller. I wanted lots of vintage pink, gold and white–and when I spotted gold angel wings in a Restoration Baby & Child catalog I had to have! Only not for hundreds of $$;). I found some on Etsy for $200 but that was still more than I wanted to pay. So I settled for white ones on Amazon for $35 and just spray painted them gold myself;). I found the sheep rocker on Craigslist…a $10 score:). I also bought the Jenny Lind crib for a steal on Craiglist–and I spray painted the ends gold with Rusto-leum metallic gold spray paint. The sweet monogram I bought from MonogramsyLetters on Etsy. I used the same gold spray paint for the monogram. My daughter and I made the flower banner out of felt! I found some on Etsy for $90 but they weren’t even as full as this. So we put our heads together and made a craft day out of it and made this one for closer to $15 including all felt and the floral ribbon we hot-glued them to. Big sister wanted to be a part of most everything…I guess with 4 brothers she’s dreamed of a sister forever:). We made baby girl a little bookshelf out of wooden crates we bought at Walmart. We spray painted each one white with a flat white spray paint and then used screws to attach them together. We used acrylic paint we already had to paint the inside of each one in different shades. We made little pendants with scrapbook paper we had laying around just using yarn, scrapbook paper and hot glue. The mason jar tree has leaves of blessings on them from a baby shower my sweet friends gave baby girl. I have the sweetest friends who insist EVERY baby needs to be celebrated…and they sprinkled her with such love a couple of weeks ago. From where I rock:)…our master door is immediately to the led with a living room in the middle of the house. 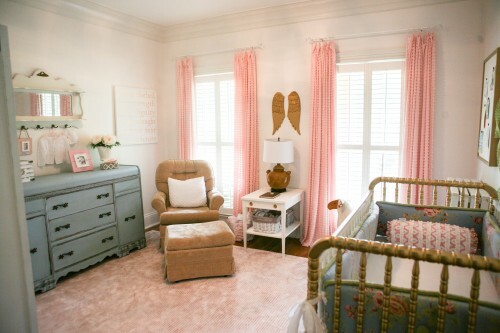 The vintage pink rug I spotted at HomeGoods and because we didn’t add a closet to this room–I found an old antique wardrobe at an antique shop. I painted it white with Farmhouse paint (my favorite chalk paint brand), sanded the edges and then spray painted the bottom for a gold-dipped look. The signs are my favorite…my prayer for her is that she is a Proverbs 31 woman…clothed with strength and dignity and she laughs without fear of the future. I saw one of these on Etsy for $$$$ and while it was tempting–I squealed when I found it for $ on Smallwoods Home. So there ya have it! Our baby #6’s nursery. We can’t wait to meet her. And I better go grab another cat nap if she’s going to give me another few nights of prodromal labor before she finally makes her grand appearance! Oh…I almost forgot the bedding! I made the bumpers for our daughter who is 10…and so thankful I held on to it! The bedskirt we all made together with left over panel fabric and white muslin cloth. I love a crib skirt with lots of layers! We didn’t even surge or hem the edges of the white fabric and literally ripped the muslin fabric in thick strips and attached to bumpers to make bows! Now we just wait for YOU baby girl!